Adeline A. Deppisch, 88, formerly of N Webster Street Port Washington died Saturday, October 20, 2007 at the Harbor Cove in Port Washington. She was born June 29, 1919 in Port Washington to Lawrence and Ann Dornbach Bares. Growing up in Port Washington, she graduated from Port Washington High School. On April 6, 1942 she married John A. Deppisch at St. Mary’s Church in Port Washington. They live on Webster Street for many years as she raised her family. He husband preceded her in death November 30, 1989. Adeline worked for a brief time at the Ozaukee County Clerk of Courts office, but was primarily a devoted wife and mother. 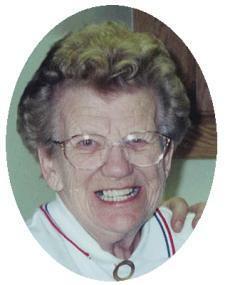 She was a member of St. Mary’s Choir and Christian Mothers and enjoyed her ladies card club. Adeline was a spunky gal who will be remembered for her sense of humor and attitude. The family wishes to express their deep gratitude for the loving care provided to Adeline from the staff of Harbor Cove and Hospice Advantage. She is survived by her children Mary Ann (Ted ) Meljac of St. Petersburg, Florida, Juli Deppisch of San Marcos, California, Tom (Laurie) Deppisch of Belgium, Wisconsin, John A. “Jack” (Judith) Deppisch of Menomonee Falls, Wisconsin, Jerry (Sue) Deppisch of Franklin, Wisconsin and Bob (Jackie) Deppisch of Random Lake, Wisconsin. Further survived by many grandchildren and great grandchildren, brothers Alvin (the late Catherine) Bares of Port Washington, Wisconsin and Gerald (Bernice) Bares of Black River Falls, Wisconsin. Preceded in death by her husband John, brother Rev. Elmer Bares and granddaughter Rebecca. Revs. Tom Lisjewski and James Ernster will concelebrate Mass of Christian Burial 6 pm Wednesday, October 24, 2007 at St. Mary’s Church, 430 N Johnson, Port Washington. Entombment parish cemetery. Visitation 4 – 6 pm Wednesday AT CHURCH. Memorials to the Alzheimers Association appreciated.